We believe that it is not enough for us to be on time, but that you need to be certain, and aware of your driver status. We take the mystery out of navigating through the airport. When your plane lands you will have a text from us confirming driver status, along with pertinent contact information. We track incoming flights so you can rest assured that regardless of your flight status, we will be there to pick you up. On your visit to Southern California, let us save you time and provide you with an excellent value in transportation. Whether you need vehicles for a day time tour of the city, hourly service for an evening out, or any other event, let our friendly, knowledgeable professional drivers serve you in one of our sedans or SUVs. We are a unique executive transportation company created by drivers, for drivers, with one simple goal in mind – to provide every passenger with high-quality private car service. Our drivers have a vested personal interest to always go above the minimum call of duty. That old adage “if momma ain’t happy, ain’t nobody happy” certainly applies to transportation, because happy drivers make happy passengers. Please see our SEDAN transfer option for parties up to 3 passengers. All fees are included with the exception of gratuity which is at your discretion. 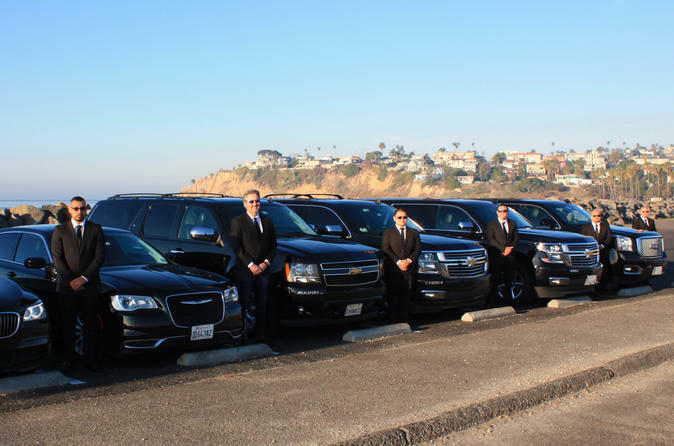 All prices are valid from/to LAX Airport to Santa Monica, Beverly Hills, West Hollywood, Downtown Los Angeles only, other cities are differing costs.